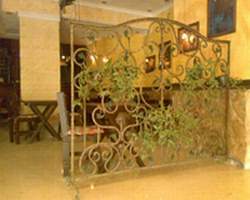 Sands Hotel is located in the middle of the bride of the Syrian desert Palmyra close to the local market and in the middle of the inhabited old city. where you can see the original life of the Syrian people in the desert which is still same since ages and ages and few minutes far from the ancientPalmyra city. Enjoy your meals at Sands Hotel Palmyra Syria restaurant watching the charming panoramicview of the palmyrian castle and sites with delicious arabic and middle eastern dishes. Don't miss having dinner at Sands Hotel Palmyra Syria bedouin tent parties in the middle of the syrian desert under the beautiful stars listening to original arabian music instruments melodies with belly dance smoking water pipe experiencing the Arabiannights.